Ed Meyerson, above with his wife Candy, is a charter member of the UAB Comprehensive Cancer Center’s advisory board and was recently named as the Director’s Circle Honoree for the 2019 ArtBlink Gala, to take place Feb. 2. Photo courtesy UAB Comprehensive Cancer Center. Ed Meyerson shared this Anne Frank quote with a gathering of doctors, administrators and supporters of the UAB Comprehensive Cancer Center on Oct. 23 at the Wallace Tumor Institute. The event honored Meyerson, a charter member of the cancer center’s advisory board who is the Director’s Circle Honoree for the 2019 ArtBlink Gala, to take place Feb. 2. “It goes back about 30 years ago, when I received a call from Martha Cohen and she said, ‘Ed, I have an opportunity for you that I know will interest you,’” Meyerson said. Having watched his father battle prostate cancer, along with his passion for community service, he accepted and went to his first board meeting alongside fellow members Lella Bromberg, Kitty Robinson, Rita Kimerling and George Simpson among others. Meyerson recalls that board members made themselves available almost 24 hours a day to help patients at the cancer center obtain money to buy prescriptions and find housing while getting treated. When Dr. Michael Birrer took over the role of UAB Comprehensive Cancer Center director last year, one of the first people he met was Meyerson. 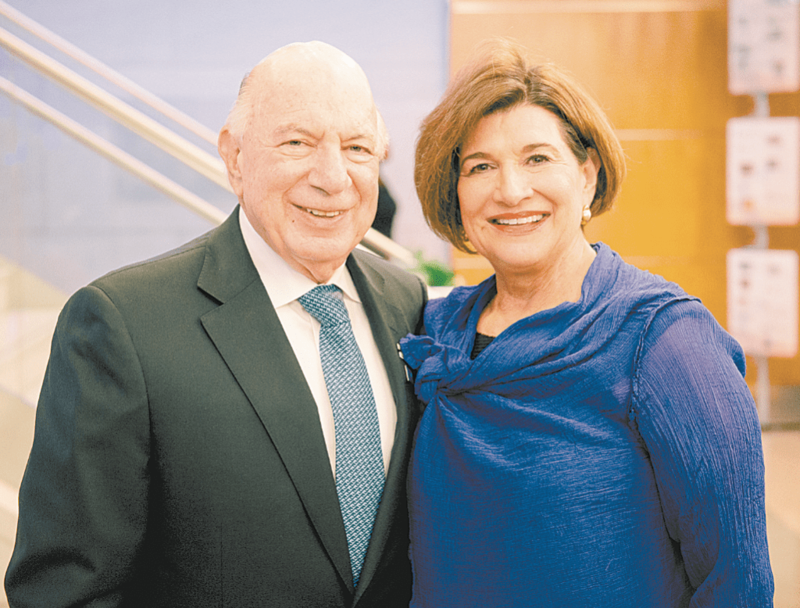 “What I was struck by when I first met him was his genuine passion and commitment to fight cancer,” he said, adding that the leadership Meyerson has shown and the strength of his relationship to the cancer center is the kind of support that is critical to its success. In addition, Birrer noted that Meyerson has been one of the center’s strongest advocates and supporters by bravely discussing his own battle with cancer with the UAB community in a positive way. Dr. Edward Partridge, who retired last year as UAB Comprehensive Cancer Center director, met Meyerson shortly after he took on the role of director in 2007. Having Meyerson serve as president of the advisory board from 2010-11 was nothing short of essential, Partridge said, as it was a year that the center was undergoing the process of writing its National Cancer Institute grant renewal. “That’s a time-consuming business trying to get that grant prepared and ready, but having Ed as the president really relieved a lot of my stress, because I knew he was going to take care of the fundraising, he was going to take care of the public relations, he was going to take care of the patient and family responsibilities, and I didn’t have to worry about that,” Partridge said. What is quickly becoming a keystone in the arch of his continued service to UAB is Meyerson’s work to create the Mike Slive Foundation for Prostate Cancer Research, which launched last year. Partridge recalled the moment when, a year before his retirement, Meyerson entered his office and discussed his desire to create a prostate cancer research foundation in a similar vein as the Breast Cancer Research Foundation of Alabama. The opportunity also allowed Partridge to have one of the “single greatest mornings” of his life, when he was able to sit down with Meyerson and Slive, former SEC commissioner, at Slive’s dedicated booth in Salem’s Diner in Homewood to discuss the foundation. Much to Partridge’s surprise, the foundation has succeeded in raising more than $500,000 in its first year. In Birrer’s 35-year career and Partridge’s 40-year career, both said they have never seen a foundation take off with such success. Partridge adding that it normally takes a foundation dedicated to cancer at least five years, if not 10 years, to reach that level of fundraising. Having had a father battle prostate cancer and losing his close friend Slive to the same, forming the Mike Slive Foundation has been his effort to change the way prostate cancer is treated and, hopefully, cured for his five grandsons. “You never know, your act of kindness can change lives in more ways than you can possibly imagine, because being a board member and being a part of the future of cancer research with a goal to eradicate cancer is a single easiest thing you’ll ever do in life to make a difference and perhaps have a monumental impact,” Meyerson said.